I have been saying welcome to my classroom for 21 years now and have been studying and or teaching some form of vampire pop culture in all of my classes. 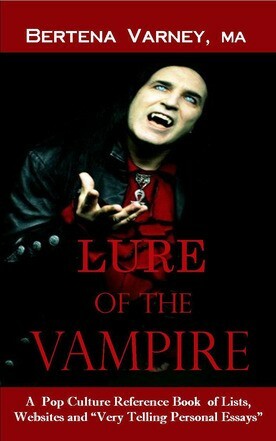 It has been fun and after I wrote the first edition of Lure of the Vampire in 2011, many of my author friends and vampire romance fans wanted me to turn it into a class to introduce them to some mythology and more books and television shows that they could watch. So after three years of looking for on online source and actually finding time, I have now created an Introduction to Vampires class. A class that is fun and student paced! This class has been created for those that are not really familiar with vampires but want to learn a little more and read essays about romance and even the women’s role in vampirism in cultures. I have supplied links for those that want more information about authors, games, kids’ books, etc but also essays that take a look at a few of the topics. The class is open to everyone for $50 until the end of August. You must join the site, send me the money via PayPal, and then I will add you to the class. There is homework that you will send me to grade, and a blog and forum area for students to voluntarily make posts. These areas are not for name calling, drama, or people attacking the “type” of vampire that others like- all of that is childish and you will be banned with no refund. It’s simple as that. The class is created based upon what my college encourages us to do is called a Flip Classroom. The teacher provides the material to read and the student comes up with their own conclusion. There isn’t a specific right or wrong on your opinions of vampires (this doesn’t mean there’s not a right or wrong on facts like dates, authors, etc). This class is to help the student read, research, and analyze in a safe environment. Too many times I have seen drama online and people get bullied for their opinion and thus I avoid forums, groups, and websites that center around drama. This is meant to be a fun introduction class for those that want to learn more about the vampire, for those that don’t know all the books or movies, or even about the academic opportunities for the studies of vampires. This is a self-paced class. All you do is purchase my book, read the lesson, watch the videos, and email me your answers. After I receive all of them then I will send you a certificate of completion. It’s that simple and fun! You can look around the site and the class introduction but the class is locked until payment is received. Anthony, thanks for letting me be here today. Any questions?